Despite there being a beehive on the state seal of Utah, honey bees aren’t “Beehive State” natives, having arrived with Brigham Young and the rest of the Mormon settlers in the 1840s. Young even called this new region “Deseret,” which means “honey bee” in the Book of Mormon. Considerably less renown would be Utah’s prominent native bee populations, with over 650 different types of native bees having been identified. In comparison, only 750 known native bee species in total exist on the east side of the Mississippi. 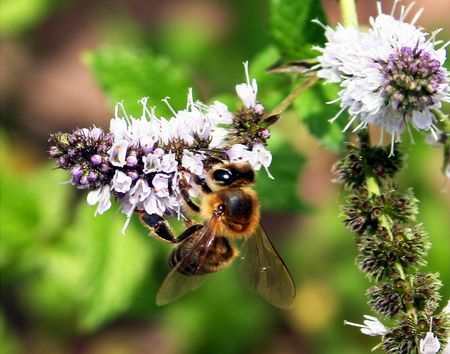 However, a push is currently underway to store more commercial honey bees in the Manti-La Sal National Forest—nearly 2,000 square miles of Utah wilderness—and it could threaten Utah’s native bee species. This national forest houses hundreds of native bees, including the struggling western bumblebee, and scientists are concerned a large incursion of honey bees may bring on disease, resource competition, and other negative effects on the ecosystem. Adee Farms, one of the biggest private beekeepers in the U.S., has insistently applied for honey bee storage in several national forests in Utah since 2012. In 2017, Adee Farms applied to set 100 beehives on all 49 sites in the Manti-La Sal National Forest, which would be hundreds of millions of honey bees. So far, Adee has gotten permission for 20 beehives at only three sites each in the Manti-La Sal. In recent years, commercial honey bee populations have decreased, with much of the blame being centered on the pesticides coating the crops that bees pollinate. Meanwhile, there’s less land available for storing hives in the off-season due to budget cuts in a federal initiative that paid farmers in the Midwest to let their land fallow, and beekeepers typically stored their beehives on these lands. “We are desperately trying to get out of pesticide areas due to the loss of our bees,” says Brian Burkett, who is an employee of Adee Honey Farms. The storage of beehives in forest service lands isn’t a new concept—the practice is in use in California and Arizona as well as in Utah’s Wasatch-Cache National Forest. Despite this, conservationists and scientists worry what this practice could do to southeastern Utah’s native bee species. Honey bees are social insects whereas many Utah native bee species are solitary, and they risk becoming outnumbered while hunting for floral sources. Also, honey bees are generalists, meaning they can pollinate many types of plants—hence their importance for commercial pollination. Native bees, on the other hand, visit specific types of plants, and if they’re driven out, their numbers could decline due to having fewer food options. This can easily affect an area’s environmental makeup, as native bees are often superior to honey bees when it comes to pollinating native flora. Biologists are also worried about the scale of resources utilized by honey bee colonies. A paper by James Cane, a Utah-based entomologist, and Vincent Tepedino, a biologist who’s argued against honey bee storage in Utah national forests, calculated the number of resources gathered by honey bee colonies, which they then translated to an equal number of solitary bee larvae. In a brief four-month period, the 4,900 beehives Adee Farms requested to store would remove an amount of pollen that could feed hundreds of millions of Utah native bees. “Absolutely, there needs to be more research to learn more about competition and impacts,” James Strange, who is an entomologist with the Agricultural Research Lab, said. Save Your Dry Skin with These Two-Ingredient Face MasksCan Honey Bees Help Monitor a City’s Cleanliness?